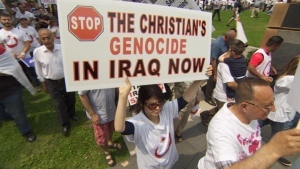 Christians are facing extinction in Iraq and Syria from Islamic State terrorists. But ISIS’s propaganda videos and magazine Dabiq offer many such statements. One such source trumpets the vow to “break your crosses and enslave your women,” underscored with a photo of the black flag instead of a cross atop St. Peter’s Basilica at the Vatican. Most Iraqi Christians are from the Chaldean and Syriac Catholic Churches, which are in unity with Rome, and so that statement can be interpreted literally as intent to destroy their communities as well as Christians generally. The U.N. special adviser on the prevention of genocide lists patterns of action whose “cumulative effect” can evidence genocidal intent: “displacement,” “practices to complete the exclusion of targeted group from social/political life,” “atrocities,” “the destruction of or attacks on cultural and religious property and symbols . . . to annihilate the historic presence of the group,” etc. These Christians can check off the entire list. Intent in the 1995 genocide case against Bosnian Muslims in Srebrenica was found in the political goals of the attacking Serbs. Without Srebrenica, the Serbs would see their sought-for state divided in two. Similarly, without Nineveh, which sits between the ISIS cities of Raqqa and Mosul and which was home to most Iraqi Christians and Yazidis, ISIS’s caliphate would be divided. As the Bosnia genocide court found, the elimination of the Muslims in Srebrenica “would have accomplished the goal of purifying the entire region of the Muslim population.” ISIS “purified” Nineveh of Christians and Yazidis. It is difficult not to conclude that the reason for the administration’s reluctance to designate a Christian genocide is not for lack of evidence but for political reasons.